See those clear dots? Dropped them right onto the card using Mod Modge Dimensional Magic. LOVE that stuff! Made this card in response to the latest Muse Challenge. Here is the beautiful inspiration photo by the super talented Vicki Dutcher. Vicki's blog, All I Do is Stamp, is full of inspiration. I love the way she emphasizes color! And she stamps and posts all the time. I kept a white background with a black sentiment and three butterflies. I changed the colors, but think I kept pretty close this time to the Muse. MOOD WHEN DONE = Flighty! Mod Modge Dimensional Magic? I've never heard of it, but it's fantastic and I bet there will be a run on it now! lol! Lovely take on Vicki's Muse - the texture of the linen is fantastic! So glad you joined us at Muse this week, Joan! JOAN! This is FABULOUS!! I loved the layering of your bflies and that Mod Modge is very cool! Thanks so much for joining in at Muse! What a great card! The bright butterflies make me smile. Do not want to be a nag but...(don't you just cringe when someone says that. :) lack of water does simulate hunger. I know you said you do. not. like. water. Have you tried slices of lemon,cucumber, berries etc in water? Make it up the night before so the flavors have a chance to infuse the water. It might help. I'm rooting for you!! Very pretty card! 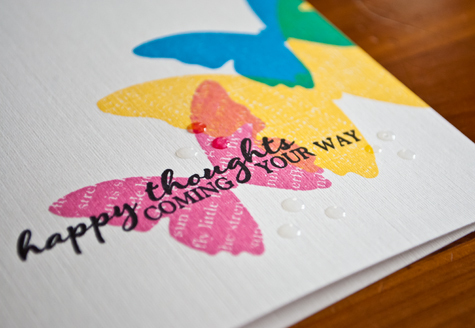 I love the bright colors and mod podge embellishment to create subtle dimension! 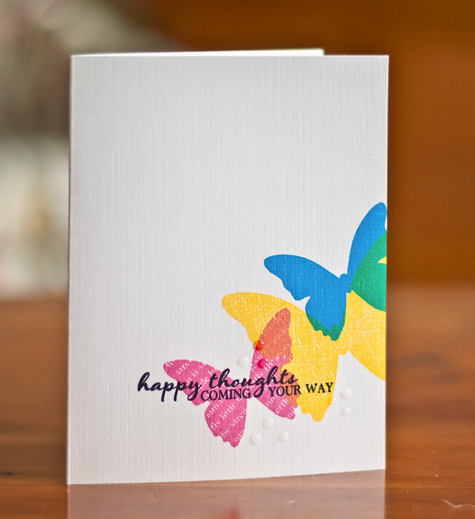 I love where the blue butterfly stamped over the yellow butterfly turns green--very nice effect, on purpose or not! Really lovely colors! and such great texture of clear dots and stamping on the linen cardstock. Oh, yeah, need some of that Mod Podge stuff. I have Viva Decor gel, which I love. Definitely going to dry dropping droplets like this. Fabulous and inspiring card, Joan!